Spoiler?! What spoiler? You knew it was going to happen. I chose this issue as my pick of the week mostly because I enjoyed the story... obviously. 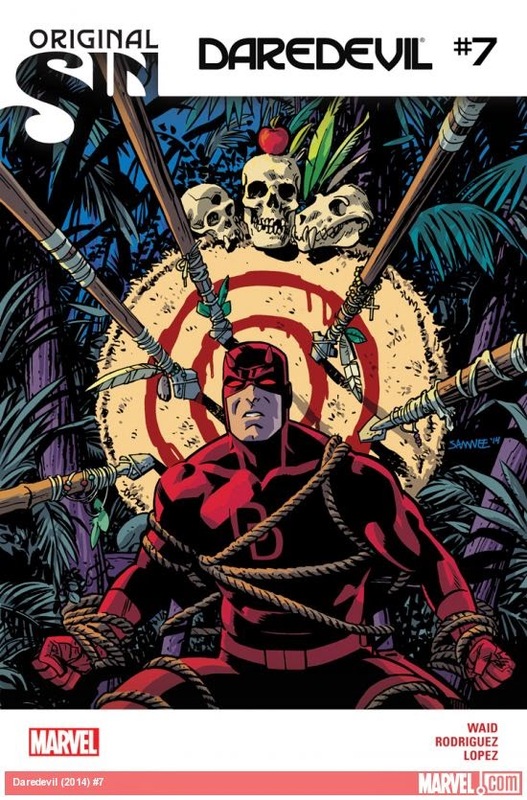 More than just the drama of having to rescue his mother in Wakanda, Daredevil also is able to confront his mother about the shocking images he saw from his past of his mother on the floor, beaten with his father standing menacingly over her. The talk between Matt and his mother was the most interesting part of the comic. It was a traumatic moment for Matt to see his father in such a powerfully villainous position considering how much he idolized his dad. You're able to learn why Matt's mother felt the need to leave her family and become a nun. The sections with Daredevil and T'Challa's sister weren't nearly as interesting, but introducing her character more and more now could just be a lead up to some future plot line. The artwork is consistently gorgeous. The lines and the colors have a good balance to them. I love how the colors always help portray the emotions and themes of each scene with shifts of lighting and hue. So all in all, it's a cool book. Even though it touches upon serious subject matters, there's still a touch of light-heartedness to it especially in Matt's character which makes me really enjoy it. It shows a strength in Matt that he doesn't get completely enveloped with the weight of problems, like he had done at times in the past.